Air force attacks targets east of Gaza City and the south after rocket fired from Gaza hit house in Be'er Sheva causing heavy damage. In a series of airstrikes, the Israeli Air Force struck in Gaza this morning following rocket fire into Beersheba during the night according to the IDF Spokesman. According to PA reports, attacks were carried out east of Gaza City and the south, against Hamas and Islamic Jihad positions. 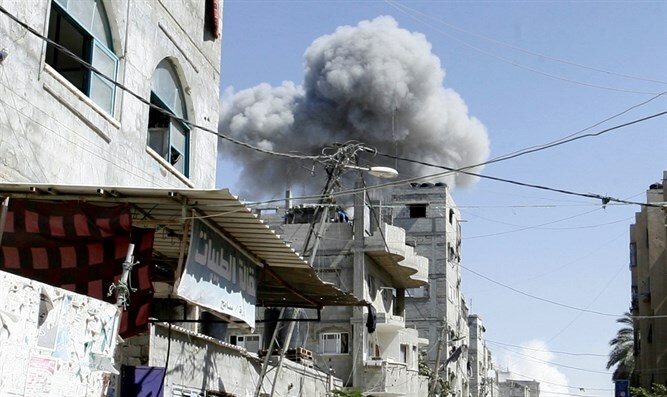 One terrorist was reported killed in the bombardment the IDF says struck twenty Gaza targets, including tunnels. Channel Ten reported that the targets hit were mainly empty outposts located in open areas. Following the fire on Beersheva and Tel Aviv, Defense Minister Avigdor Liberman announced closure of the Erez and Kerem Shalom crossings, as well as restricting Gaza fishing to three miles from shore.